On June 22 and June 25, Glenbow Museum, in Calgary, will present the Ottawa International Animation Festival's Welcome to Kanata, a selection of 10 short contemporary animated films by Canadian Aboriginal filmmakers, curated by award-winning filmmaker and director of the National Indigenous Arts Coalition, Ariel Smith. June 21, 2016. On June 22 and June 25, Glenbow Museum, in Calgary, will present the Ottawa International Animation Festival's Welcome to Kanata, a selection of 10 short contemporary animated films by Canadian Aboriginal filmmakers, curated by award-winning filmmaker and director of the National Indigenous Arts Coalition, Ariel Smith. The program includes Spirit of the Bluebird, a moving tribute to Gloria Black Plume, a Niitsitapi mother, grandmother and auntie who was brutally beaten to death by two men in a Calgary alley in 1999. Co-director Xtine Cook involved the Black Plume family throughout the film-making process. 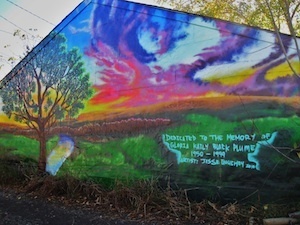 The family delivers raw voiceovers, recounting memories to the backdrop of the graceful animation of a spray painted mural, created by co-director and graffiti artist Jesse Gouchey. The mural depicts a bluebird in flight over the prairies. The thematic and aesthetic diversity presented in Welcome to Kanata is intentional and reflective of the diversity of the Indigenous nations.